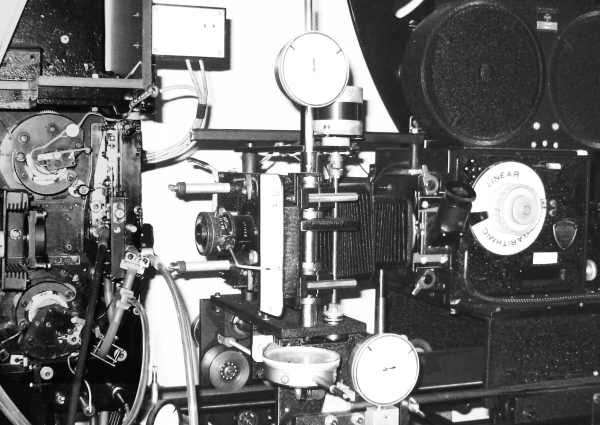 To meet the requirements of realibility I wanted for my optical printer, I first utilized electronics and then computer to control the eleven motors that make up this machine. This research then led me to the making of simple and strong command cases for various cameras, to adapt them for filming frame by frame. I was then asked to provide automation for the movements of both handmade and professional animation tables (OXBERRY). Since the use of a micro-computer had become necessary, the standard PC (286 and following) was chosen. The main point of such a computerized command depends on the software, which has to be very easy to use and allow anyone, even without any experience with computer keyboards, to handle it very quickly. For its use no instructions are needed. All the necessary information is provided as and when required by the program. Giving priority to the importance of the software offers other advantages : the possibility of high precision control over all parameters of the working of the motors and to take into account the particular working habits of each operator. Each case is a prototype that must be studied and appropriate solutions must be found to meet each need. Website optimized for FIREFOX (screen resolution 1024x768 or higher).